THE waters surrounding Singapore may look murky, but they could be home to species of marine creatures that are possibly new to science, a local study has found. At least 14 such species have been discovered in the first Comprehensive Marine Biodiversity Survey conducted here. They include an orange-tinged sea sponge found during a reef survey, a warty-looking sea anemone burrowing in mudflats in northern Singapore, and a conical hermit crab from the seabeds near the Southern Islands. The survey led by the National Parks Board (NParks) to study Singapore’s marine ecosystems started four years ago, and is now almost complete. Mudflat sampling was completed in April last year, while data collection at seabeds and reefs is expected to end by May next year. And while there are still some months to go before data collection is complete, researchers have already recorded more than 80 species of sea creatures found for the first time in local waters, in addition to the 14 new ones. Another encouraging find was the rediscovery of about 10 species of creatures such as crabs and catfish last seen here decades ago. The zebra crab, for instance, was rediscovered in waters around the Southern Islands. The orange crab with a striped shell was last seen in the early 1960s, and repeated surveys in the 1990s had failed to find the species. 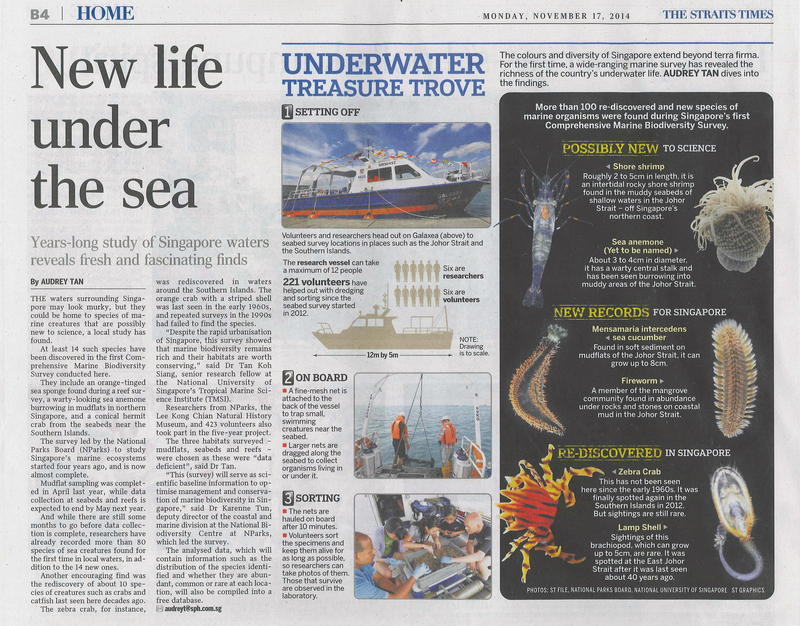 “Despite the rapid urbanisation of Singapore, this survey showed that marine biodiversity remains rich and their habitats are worth conserving,” said Dr Tan Koh Siang, senior research fellow at the National University of Singapore‘s Tropical Marine Science Institute (TMSI). Researchers from NParks, the Lee Kong Chian Natural History Museum, and 423 volunteers also took part in the five-year project. The three habitats surveyed – mudflats, seabeds and reefs – were chosen as these were “data deficient”, said Dr Tan. “This (survey) will serve as scientific baseline information to optimise management and conservation of marine biodiversity in Singapore,” said Dr Karenne Tun, deputy director of the coastal and marine division at the National Biodiversity Centre at NParks, which led the survey. The analysed data, which will contain information such as the distribution of the species identified and whether they are abundant, common or rare at each location, will also be compiled into a free database.